Ditch the pine tree air freshener, Febreze, or that offensive-spritzing plug in. We found something that ups the ante in the home smelling department. And it happens to be très fancy. Agraria is known for making home spaces (and bathrooms alike) smell fantastic, whether it be in the form of potpourri, diffuser, candle, bar soap or even, tassel. Agraria’s scented tassels (above) are called TasselAire™. They come in a cylinder with a little bottle of oil and small syringe. Apply oil to tassel at your leisure (no need to go crazy, it’s pretty fragrant). There are eight different scents. The one hanging from above door handle and now by my desk is balsam. A deep woody cedar with a good hit of spice, a very regal scent that I associate with mansions like this one. 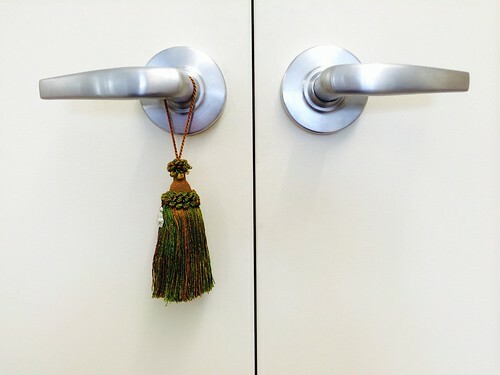 We love that it’s a home decoration objet and a smelly thing in one - every room can use a tassel.